This page is intended to be a gateway to English Classical Music at the library (so doesn't cover all aspects). If you have a particular query in this area that you'd like to discuss with us, we'd love to hear from you! You can email us, or come in and talk to us (at the Central Library in the Sound & Vision area). The title-underlined links will take you directly to our catalogue. Some featured items are linked via a cover to enable you to read more about the items, see track information or listen to excerpts. England my England, performed by Choir of King's College, Cambridge ; with Stephen Cleobury, Sir Philip Ledger, or Sir David Willcocks, conductors. Zadok the priest / Handel -- Lux aeterna (Nimrod) / Elgar -- Praise my soul the king of heaven -- Spem in alium / Tallis -- Hallelujah chorus / Handel -- requiem - Pie Jesu / Rutter -- Come down, o love divine -- O nata lux de lumine / Tallis -- Ave verum corpus / Byrd -- When I survey the wondrous cross / arr. Rutter -- Iustorum animae / Byrd -- Come ye sons of art away / Purcell -- Faire is the heaven / William Harris -- Psalm 67: God be merciful unto us / Bairstow -- The old hundreth / arr. Vaughan -- Jerusalem / Parry -- I vow to thee, my country (Jupiter) / Holst -- Song for Athene / Tavener -- Magnificat in G / Stanford -- Thous knowest, Lord / Purcell -- Hosanna to the son of David / Gibbon -- The day thou gavest / arr. Rutter -- Mass in G minor - Kyrie / Vaughan Williams -- Greater love hath no man / Ireland -- If ye love me / Tallis -- Jubilate deo / Britten -- Drop, drop, slow tears -- To be sung of a summer night on the water I / Delius -- I was glad / Parry. Vaughan Williams on music, edited by David Manning. (2008). The Oxford history of English music, John Caldwell. (1991-). 2 volumes. The growth of a distinct national style is traced from the early beginnings through the early Tudor period and the Reformation, to the Elizabethan and Stuart England. The arrival of Handel is related to the period of experimentation following Purcell's death in 1695 and the volume concludes with his decision to remain and the end of the Stuart monarchy. Composers are placed in the context of the music of their contemporaries, while the social, religious, and historical background to their music is given full attention. There are over two hundred musical examples and sixteen pages of plates. 'Englishness' in music : from Elizabethan times to Elgar, Tippett and Britten, by James Day. (2001). A Victorian parlour evening : let me dream again.... Strictly speaking this is not necessarily "English music" but music the English listened to,played or sung, as part of the weekly recreational activities. But the contents are quintessentially associated with all things English. Includes I dream that I dwelt in marble halls; Come into the garden, Maud; Take a pair of sparkling eyes; Believe me, if all those endearing young charms; Thais. Meditation by Massenet and Love's old sweet song. 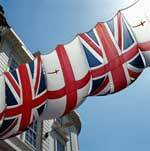 English national songs : from Greensleeves to Home sweet home. John Potter and Lucie Skeaping with the Broadside Band. The songs on this recording span the renaissance through to the nineteenth century and most are very well known tunes, even if the words are fading. The producers have endeavoured to find the earliest surviving version of the song to include here. Hark! hark! the lark : music for Shakespeare's Company. Catherine Bott, Julia Gooding, sopranos ; Joseph Cornwell, tenor ; Stephen Varcoe, baritone ; Parley of Instruments ; Peter Holman, director. No survey of the English arts would be complete without at least some reference to Shakespeare. Only the last of Shakespeare's plays have specially composed music. Shakespeare's Company was called The King's Men and their main composer was the court lutenist Robert Johnson. BBC Proms : the centenary 1895-1995. The original BBC recordings with the favourite audience participation. Playing Elizabeth's Tune, DVD, William Byrd, performed by the Tallis Scholars. The works include: 'Ave Verum Corpus', 'Diffusa Est Gratia', 'Magnificat', 'Ne Irascaris', 'O Lord, Make Thy Servant Elizabeth' and 'Vigilate'. Filmed in Tewkesbury Abbey featuring a mass for four voices. The second part is a documentary on Byrd made for television. There were three ravens : songs rounds and catches, by Thomas Ravenscroft. Performed by the Consort of Musicke. Although Ravenscroft is hardly a household name, in his day he was highly regarded, having gained his BMus at Cambridge University. His philosophy emerging in the prefaces to his many publications was that life was to be enjoyed - " accept therefore kindly, what is done willingly, and published onely, to please good Company. Water music and Fireworks by Handel. Performed by Le Concert Spirituel, conducted by Herve Niquet. Although Handel was born in Germany, in 1712 Handel was given permission to travel to England. That began an immediate and lifelong affinity - of Handel for England, and the English for Handel's music. A midsummer night's dream : music to Shakespeare's play, by Mendelssohn. Performed by Kathleen Battle, Frederica von Stade, Dame Judi Dench, with the Boston Symphony Orchestrea and Seiji Ozawa. Symphonies no 103 (Drum roll) and no. 104 (London), by Haydn. Performed by the Royal Concertgebouw Orchestra, with Nikolaus Harnoncourt. Haydn visited England twice where he was hugely successful. 'The' London symphony is his last, but in all he wrote 12. Sir Neville Marriner conducts two more - Symphonies no 99 and 102, also from the second visit period on that disc. The music of Eric Coates. Performed by Royal Liverpool Philharmonic Orchestra, Sir Charles Groves, conductor ; London Symphony Orchestra, Sir Charles Mackerras, conductor ; City of Birmingham Symphony Orchestra, Reginald Kilbey, conductor (remainder). These pieces have graced both the concert hall and the popular TV screen. Theme from "633 Squadron" ; Drake 400 suite ; Puppet serenade ; New Zealand suite ; Arabian celebration ; The Venus waltz ; Prisoner of war march (The Kreigie) ; Minuet in blue ; Theme from "The trap" ; Girl with a dream ; Theme from "Lancelot and Guinevere", by Ron Goodwin. (Performed by the New Zealand Symphony Orchestra, with the composer as conductor. 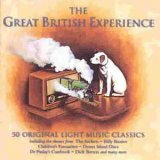 The library owns many CDs in this British light music series e.g. Nell Gwyn ; Gipsy suite ; Dances from Henry VIII ; Berceuse ; Coronation march ; Romeo & Juliet ; Tom Jones waltz : (Sophia's waltz-song) ; Merrie England, by Edward German. Orchestral works vol 3 by Percy Grainger. 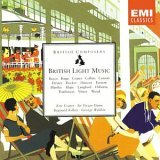 British light music. Pro Arte Orchestra. Contents include works by Eric Coates, Ronald Binge (e.g. Elizabethan Serenade), Robert Farnon, Frederic Curzon and others. Below you'll find some catalogue searches for music from English Composers. Falstaff ; Romance for bassoon ; Cello concerto ; Smoking cantata . Performers: Andrew Shore, baritone (last work) ; Graham Salvage, bassoon (2nd work) ; Heinrich Schiff, violoncello ; Halle ; Mark Elder, conductor. Elgar so enjoyed composing Falstaff he wrote that "it may prove to be among my best efforts". It is not as well known as many of his other compositions but it is certainly representative. He described his cello concerto as "a man's attitude to life" and "a real large work and I think good and alive. It is one of the "great works" of the cello repertoire. Orchestral favourites. Fantasia on a theme of Thomas Tallis ; Norfolk Rhapsody No. 1 ; In the Fen Country; Fantasia on Greensleeves ; Concerto Grosso. Performed by the New Zealand Symphony Orchestra ; James Judd, conductor. 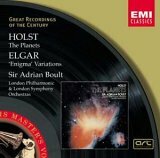 The planets / Holst. The disc also contains the Enigma Variations by Elgar. Performed by London Symphony Orchestra (Elgar) ; London Philharmonic Orchetra (Holst) ; Sir Adrian Boult, conductor. Sir Adrian Boult recorded this suite no fewer than 5 times over 33 years. This final account was recorded in 1978 was one of the very last things he did for the gramophone. The seven movement Planets suite took shape around 1915 and is scored for a very large orchestra - including bass flute, 6 horns, organ and a 6 part women's chorus. Performed by Bournemouth Symphony Orchestra ; Richard Hickox, conductor. Like many other English composers, Britten drew heavily on folksong for inspiration, and this is reflected in this selection - Folksongs (including The foggy, foggy, dew; The Ash grove; O waly, waly; The plough boy; Oliver Cromwell) sung by Paul Esswood, countertenor and James Griffett, tenor ; with Judith Ridgway, piano ; Timothy Walker, guitar. Here's a howdy do : a Gilbert & Sullivan festival.